Ribbon seals are found in the northern Pacific Ocean and are often seen hauled out on sea ice during the late winter and spring. Adult seals have a distinct pattern of light, ribbon-like bands that encircle the head and neck, front flippers, and hips. Image credit: NOAA. Ribbon seals are a northern Pacific species that gives birth, nurses their young, and molts on the offshore pack ice of the Okhotsk, Chukchi, and Bering Seas. During the late winter and spring, the seals are commonly seen hauled out on sea ice. During the summer and fall, ribbon seals are rarely seen hauled out on ice or land. It is believed that they spend these months at sea. It is estimated there are 240,000 ribbon seals across their entire range. 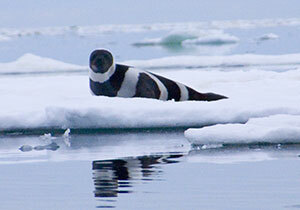 Ribbon seals are distinctly colored. Pups are born with a bright, wooly coat of white fur. After 4 weeks, the pups molt, and their coats change to a silver-gray color with a dark, blue/black back. Adult seals have a distinct pattern of light, ribbon-like bands that encircle the head and neck, front flippers, and hips. In males, the bands are near white, with the rest of the body black. Females display similar markings, but there is less contrast between the dark and light bands, and their bodies are browner in color. Adult seals are generally 1.5 m (5 ft) long and about 80 kg (175 lb) in weight. Male ribbon seals have a unique air sac that connects to the trachea and extends over the ribs. It is hypothesized that when inflated, this organ may provide extra buoyancy and/or be used by males to produce sounds during the breeding season. Sounds recorded for ribbon seals include broadband “puffing” sounds, grunts and roars, as well as intense, prolonged “downward sweeping” sounds. The puffing sound has a frequency below 5 kHz and lasts a little less than 1 s. Sweeping sounds range in frequency from about 200 Hz to 5 k Hz in downward sweeps of 2-5 kHz each. The source levels of the puffing sounds are about 20-25 dB lower than the sweeping sounds. It is hypothesized that the sounds of ribbon seals are associated with social interactions during the breeding season and/or territorial behavior.